Nestled in the heart of Hialeah in the northwest corner of Miami-Dade County, the Hialeah Campus has enjoyed a long, successful history of excellence in education. Initially located on the second floor of the Palm Springs Mile Mall and offering mainly English-language and citizenship studies for recently arrived Cuban and Haitian immigrants, what was then called the Hialeah Center moved to its present location in 1980. Since then, Hialeah Campus has significantly expanded its program offerings and services to meet the growing needs of the Northwest Miami-Dade County area. 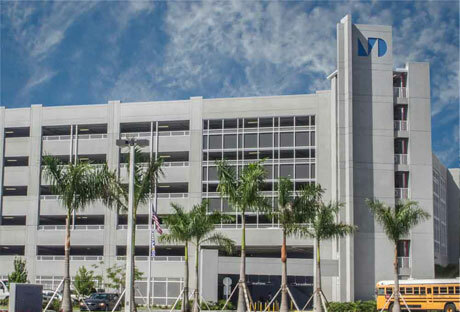 Hialeah Campus became Miami-Dade College’s seventh campus, accorded official campus status by the Florida State Board of Education in 2005. The Campus serves the Greater Hialeah area, offering day, evening and Saturday classes as well as complete student support services in admissions, registration, advisement, and financial aid. It has three laboratories with state-of-the-art equipment for studies in microcomputers, languages, and office technology. The Hialeah Campus offers a wide variety of courses which offer immediate career-entry training and a full range of university parallel programs leading to associate and bachelor’s degrees. The Campus offers offer associate degree programs such as Accounting, Business, Computer Information Systems and Criminal Justice. We also offer the full Bachelor of Applied Science in Supervision and Management. Certificate programs and many short-term educational opportunities are also offered as credit and through Continuing Education and Professional Development. The Vocational Credit Certificate Programs are courses providing career entry in Computer Technology, Office Technology, Electronics and Early Childhood Development. The Hialeah Campus also hosts a large and comprehensive English language training program for speakers of other languages in various instructional formats. Come to Hialeah Campus and see what opportunities we can provide you for your career goals and aspirations! We are here to assist you!